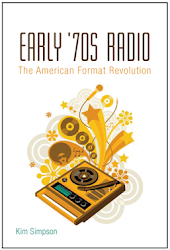 So many of the sub-chapters in early '70s pop music history involve artists whose radio strategies from the '60s ran into complications. 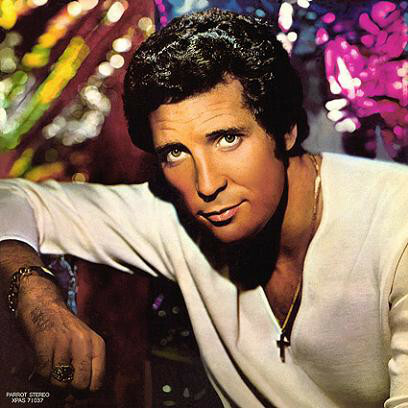 Sir Tom Jones, the Welsh emblem of libido in a tuxedo with the mastodon voice, whose Vegas persona found solid appeal with the youth market's mothers, was no exception. He shared manager Gordon Mills with Engelbert Humperdinck, a singer who perhaps embraced that unhip, bread-and-butter demographic more hungrily than did the more soulful Jones. His early '70s singles—which included a hit even bigger than "It's Not Usual," "What's New Pussycat," or "Green Green Grass of Home"—plot a course to mid-'70s pop chart oblivion, which forced a late '70s re-route to country radio, followed by a dance re-branding in 1988. Such is the very bigness of Tom Jones, though. Space has gotta be made somewhere for it. In his Over the Top and Back (2015), a regretful Tom Jones reveals that his excitement to record a version of "Without Love (There Is Nothing)" by his idol Clyde McPhatter caused him to reject a song called "The Long and Winding Road" that Paul McCartney had offered exclusively to him. 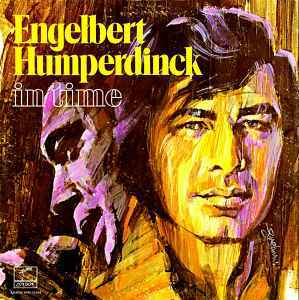 His first choice paid off nicely, though, going Top 5 and giving him the chance to further demonstrate the R&B roots that differentiated him from his rival Engelbert Humperdinck. It featured a unique, out-of-fashion spoken intro he was eager to include against the wishes of in-house Decca producer Peter Sullivan, which Jones believed someone could only "pull off if there's belief in what you're saying." (The 1957 McPhatter track included no such intro.) James Luck and John Szego's "The Man Who Knows Too Much" sounded like a lost James Bond theme and leapt out as a 45-only B side. 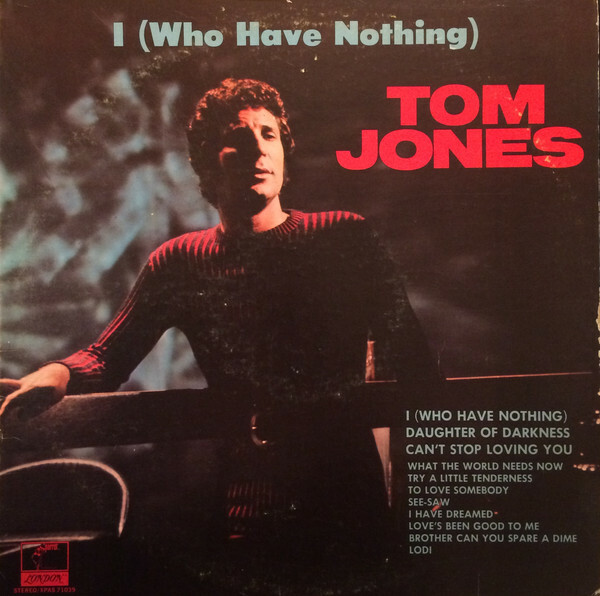 Side A: "Without Love (There Is Nothing)"
Side B: "The Man Who Knows Too Much"
The disembodied female voice in the intro hinted at impending doom, which might be understood now as Jones's forthcoming loss of chart momentum. (An accompanying steel guitar is chosen over theremin.) The darkness soon scatters, though, because Jones can't help but ham it up (climaxing at 2:58, when he yells "why did you feel so good! "—or something). His version of Jerry Reed's 1967 country hit "Tupelo Mississippi Flash" on side B showcased Jones's stylistic versatility, which made his recording gameplan as much of a challenge as it made his stage show so dynamic. The Welshman Jones did a good US southerner, although his enunciation of the "e" in Tupelo gave him away. Side A: "Daughter of Darkness"
Side B: "Tupelo Mississippi Flash"
Tom Jones released his 45 of "I (Who Have Nothing)" (covering former Drifter Ben E. King) within a year of releasing "Without Love (There Is Nothing)" (covering former Drifter Clyde McPhatter). The two "nothing" songs were quite something though, reaching #14 and #5, respectively. "I (Who Have Nothing)" had first been an Italian hit in 1961 for Joe Sentieri called "Uno Dei Tanti" as composed by Carlo Donida and Giulio "Mogol" Rapetti. Its lovelorn angst evokes the male-vocal Neopolitan song tradition that also brought forth such familiar melodies as "O Sole Mio" and "Santa Lucia." The English lyrics Jones used for his version—the highest charting one in the US—had been concocted by the rock 'n' roll songwriters Jerry Leiber and Mike Stoller for the Ben E. King record. Side B sported a fine track called "Stop Breaking My Heart," written by Jones manager Gordon Mills along with his arranger and perpetual-motion band conductor Johnny Harris. 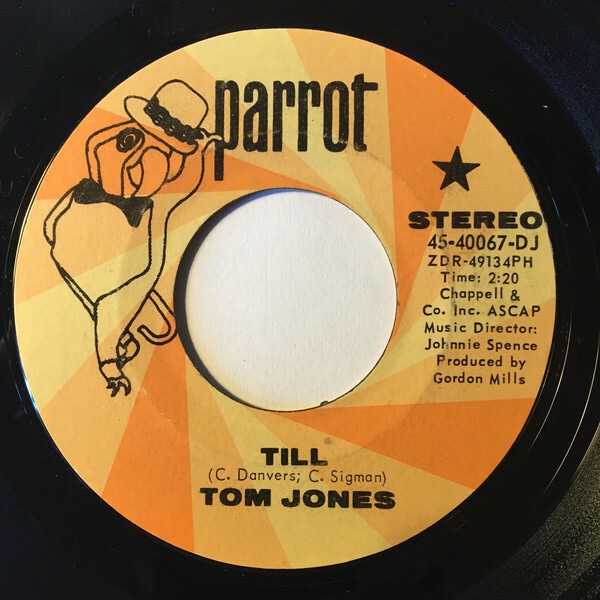 With its Motown vibe, it came from an underappreciated single Jones had put out in 1966. The album's "Wales: The Land of Song" image on the back could be the front cover for a theme album Jones might still conceivably record. Side A: "I (Who Have Nothing)"
Side B: "Stop Breaking My Heart"
This is not to be confused with "I Can't Stop Loving You," the Don Gibson-penned Ray Charles weeper that Jones had included on his essential Live at the Talk of the Town LP. It's an altogether different song written by Waddington-Bickerton, the team that would soon provide star-making hits for the UK's Rubettes. Originally included on the April 1970 Tom album, the track found an encore spot on the US edition of the November 1970 I (Who Have Nothing) album thanks to airplay action. 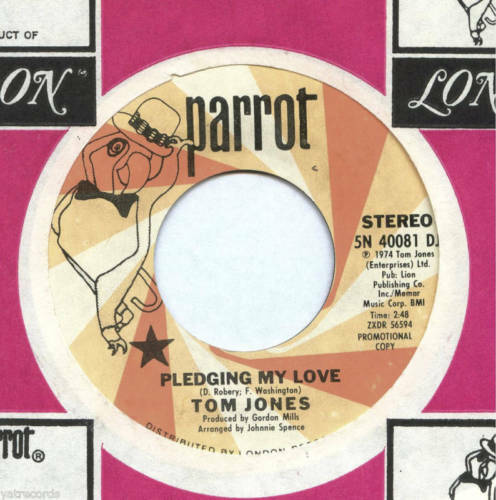 "Never Give Away Love," one of Jones's buried treasures (written by manager Gordon Mills), hailed from the same forgotten 1966 single as "Stop Breaking My Heart" on the flipside of his previous one. Side A: "Can't Stop Loving You"
Side B: "Never Give Away Love"
For its first six weeks on the Billboard Hot 100, "Puppet Man" appeared as a single with the emotive Ben Peters song "Every Mile" on the B side. A reissue with "Resurrection Shuffle" as the new B side, though, possibly to consolidate conflicting radio attention, took its place and enjoyed a run as a double A side. Neil Sedaka and Howard Greenfield's "Puppet Man," which attempted to muscle in on James and Bobby Purify's metaphorical turf, came off badly from any angle, with its payoff line being "If you want to see me do my thing, pull my string." It hadn't worked any better as a female-perspective 5th Dimension single. "Resurrection Shuffle," though, was a cheeky wink at the Jesus-rock craze that the British trio Ashton, Gardner and Dyke had a minor hit with in 1970, and it's one of Jones's best recordings from this era. 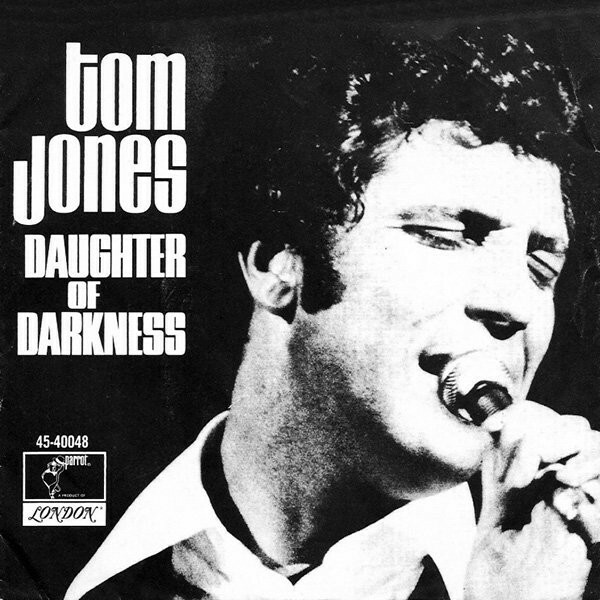 Tom Jones's biggest hit of the early seventies distinguished itself by serving up the phrases "she always knows her place" and "she's never in the way" during an era otherwise known for heightened feminist awareness. Even so, its high ranking on the easy listening charts indicated that the minor-key sizzler had a sizable female listenership. Or did that ranking reflect older generation values? Composer Paul Anka apparently regretted it. From Jones's Over the Top and Back: The Autobiography (2015), p. 298: "Paul Anka wrote ['She's a Lady'] especially for me, scribbling the lyrics on the back of a TWA menu, somewhere between New York and London, and adding the tune in an hour and a half at a piano later. Afterwards he'll declare that he hates the song—will claim that it's his least favorite number of any that he wrote and that he thinks it's chauvinistic. Maybe he's right. Actually, definitely he's right. But it was a hit for me—a dance floor number in the earliest days of disco and the last significant hit I would have in America for a number of years." In his My Way: An Autobiography (2014), Anka expressed his view this way: "I dislike 'She's a Lady' more than anything else I've written. I'm not saying I don't have a chauvinistic side, but not like that. Still, I wanted to make it as realistic as possible, and Tom Jones is swaggering and brash as a Welsh coal miner in a pub on Saturday night." She knows what to do and how to tease me. 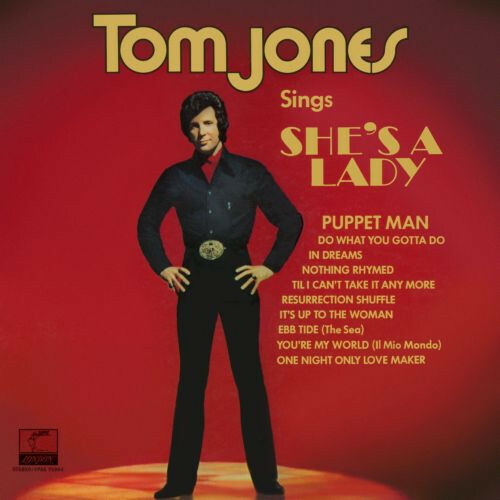 Side A: "She's a Lady"
For his follow up to "She's a Lady," Jones abandoned the discotheque for the ballroom, changing into his tuxedo as he ran. "Till" had been a 1956 hit in France (as "Prière Sans Espoir") for the operatic singer Lucien Lupi. Other famous renditions were done by Percy Faith (as a 1957 instrumental), Jane Morgan (who sung the Carl Sigman English lyrics for the first time in 1958), and Caterina Valente (as a 1960 hit sung in Italian except for the refrain and title). 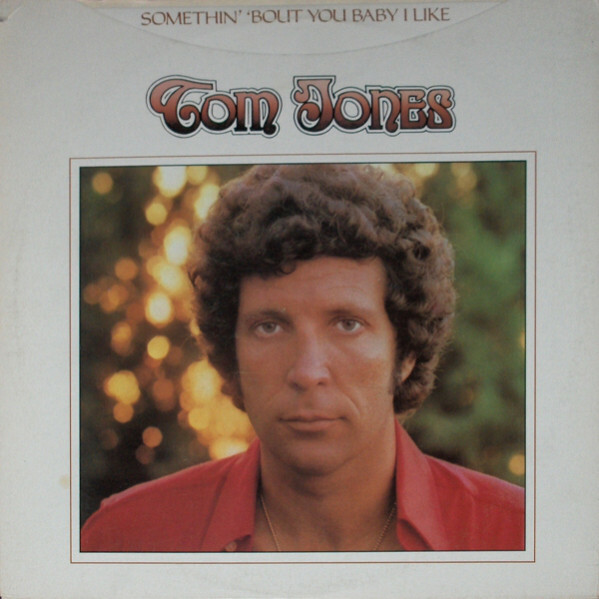 Many versions down the road, Tom Jones gave it the brash ballad treatment (true to its original European incarnation) and reached #2 on the UK singles chart. For the flipside, Jones reached again into the variété française pantry and chose "Il est Mort le Soleil," a 1967 hit for Nicoletta written by Pierre Delanoe and Hubert Giraud, given new English words (as "The Sun Died") by Ann Gregory and Ray Charles, who unveiled it on his 1968 Portrait of Ray album. Neither side of this 45 appeared on any album. 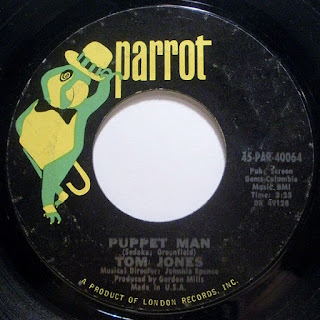 Side B: "The Sun Died"
Something in Tom Jones's subconscious (or conscious) mind gave him the urge to express puppet metaphors. "The Young New Mexican Puppeteer" was either heavily symbolic or merely detailed, telling of a boy in Albuquerque who found a means of generating "peace and joy." The Wikipedia entry for this song reports, with no sources, that the chorus melody comes from Pinocchio. This is not invalid: If you listen to the Tom Jones chorus at :51, then listen to the segment at :05 - :11 of "When You Wish Upon a Star" from the soundtrack, you'll hear a similarity. A non-album Carpenters-style ballad by Jones's arranger Johnnie Spence appears as the B side. 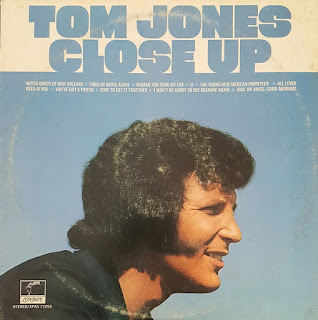 Notice on the album cover for Close Up how the ring wear looks as if the wind is blowing a crater into young Sir Tom's coif. Side A: "The Young New Mexican Puppeteer"
Side B: "All That I Need Is Some Time"
You detect a familiar early '70s bubblegum sound in "Letter to Lucille" because it comes from Tony Macaulay, who wrote such era pop quintessentials as "Love Grows (Where My Rosemary Goes)" and "Smile a Little Smile for Me." A complementary song called "Thank the Lord" by Australian songwriter Tony Cole appeared on the flipside but not on the album, all of which otherwise stays true to the "She's a Lady" sound. 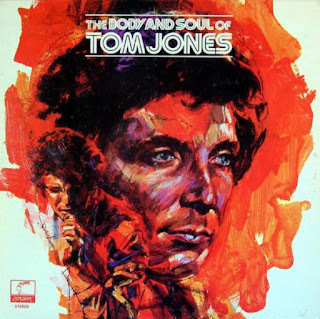 Shel Starkman, who did the cover art for The Body and Soul of Tom Jones, also did one apiece for each of manager Gordon Mills's other star clients: Engelbert Humperdinck (In Time) and Gilbert O'Sullivan (I'm a Writer Not a Fighter). 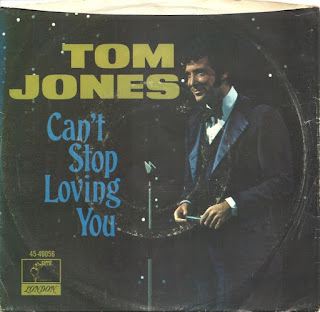 Side A: "Letter to Lucille"
Side B: "Thank You Lord"
After "Letter to Lucille," Tom Jones went through a Hot 100 cold spell, breaking through only one more time (with 1977's "Say You'll Stay Until Tomorrow") until 1988 (the year he covered Prince's "Kiss"). Two more of his early '70s singles did make it to the easy listening charts, though, the first one being a song by Richard Supa (formerly of the group Man) called "Somethin' 'Bout You Baby I Like." This was a bouncy number that would have fit easily in the Leo Sayer catalog; curiously enough, British hard rock institution Status Quo would rework it as a Top Ten UK in 1980. Jones kept the non-album B side tradition alive with another " 'Bout" song called "Keep A-Talking 'Bout Love," a welcome contribution to the early '70s Jesus-and-brotherhood spirit by US songwriter Ben Peters, who would soon be enjoying massive success with Freddy Fender's "Before the Next Teardrop Falls." 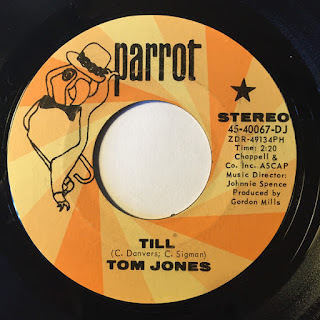 Side A: "Somethin' 'Bout You Baby I Like"
Side B: "Keep A-Talkin' 'Bout Love"
The non-album "Pledging My Love," a countrypolitan interpretation of Johnny Ace a la Charlie Rich, indicated which direction Jones would take from the late '70s to the late '80s. The versatile singer never was and never would be a one-genre guy, but the newly built format structures in the demographic-smitten radio and music industries demanded compliance. By 1977, then—the year his first U.S. country chart entry ("Say You'll Stay Until Tomorrow") went #1—Jones the Voice would call country home until 1986. Side B of "Pledging My Love" contained another hidden non-album nugget, a pared-down, rocked-up rip-through of J.R. Bailey's "I'm Too Far Gone (To Turn Around)," a song that Bailey, Bobby Bland, Joe Simon, and Freddie Scott had all done before him with downcast demeanor. Side A: "Pledging My Love"
Side B: "I'm Too Far Gone (To Turn Around)"